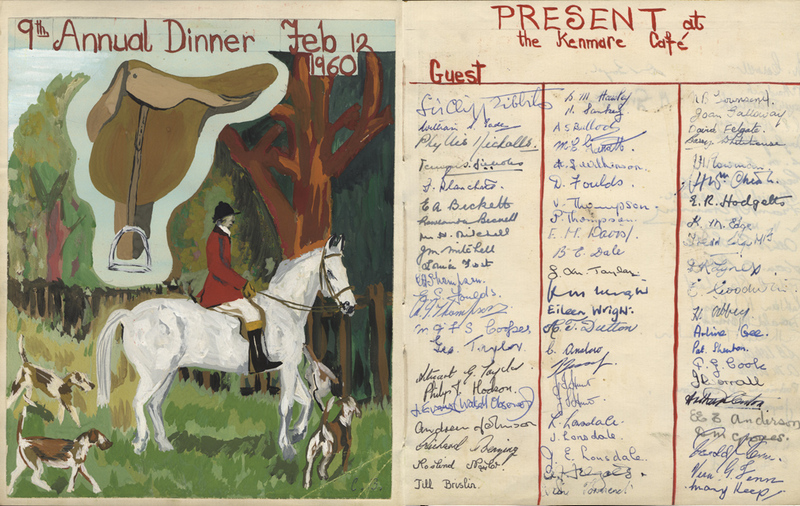 Details of the inaugural dinner in 1926. This seems rather a strange post for an ex Chuckery School lad to be writing and about something as specific as The Old Blues Association. Some years ago I purchased a considerable number of items concerning this very association. Included in the many documents were two albums, one was dated from 1926 to 1939 and the other from 1951 to 1973. 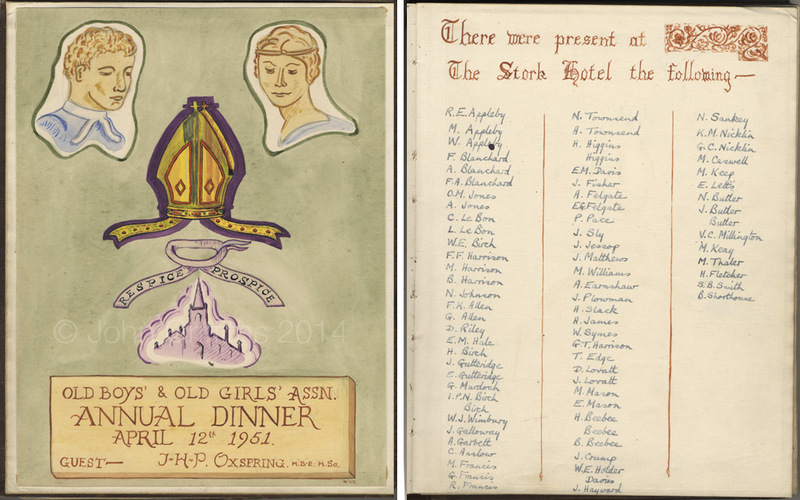 Both contained details of the annual dinners organised by the Blue Coat School Old Boys & Girls Association. The earlier one was concerned with just The Old Boys Association but the later one was for both Old Boys and Old Girls Association. Each year an artistic pupil was selected to illustrate a title page, the following pages contained the signatures of all those who attended the event. The artwork, in many cases, is of a high standard making both albums very appealing historical documents. They are currently housed at Walsall Local History Centre and are available for public viewing; Accession 1205, The Old Blues Association dinner guest books, 1926-1973. Along with the two albums there were many other items from the Association including membership tickets, dinner menus, admission tickets and Association accounts, many of the items were printed by the pupils at the school. 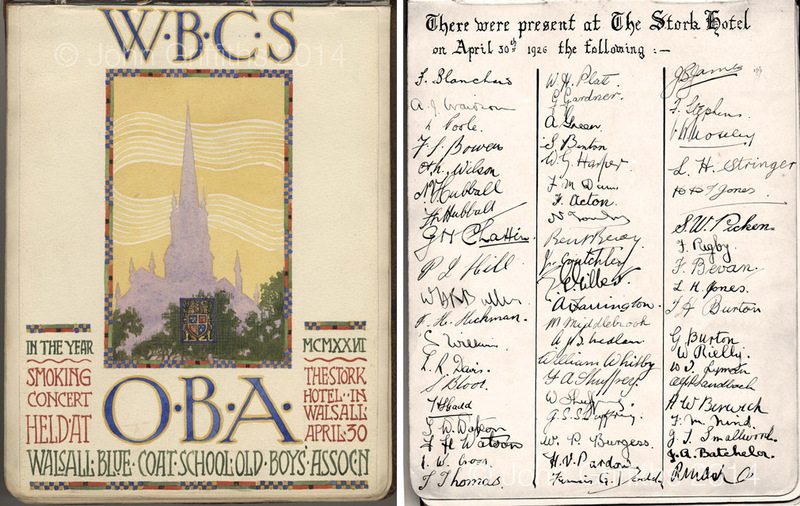 The Old Boys Association was the first to appear in 1926, their inaugural meeting was a Smoking Concert at The Stork Hotel on the 30 April 1926, the title page and the signatures some of the ninety-four that attended can be seen in the image above. In March 1934 the Old Girls’ Association was formed after a meeting was held at the new school in Springhill Road. One cannot help but think the initiative for the two Associations came from the head, Frederick Blanchard. Frederick was chairman of the Association and was in later years assisted in the running of the organisation by his daughter, Freda Alice, a former pupil and teacher at Blue Coat Junior School. In 1951 the second album was started and the two associations were amalgamated to form the Old Boys’ & Old Girls’ Association. 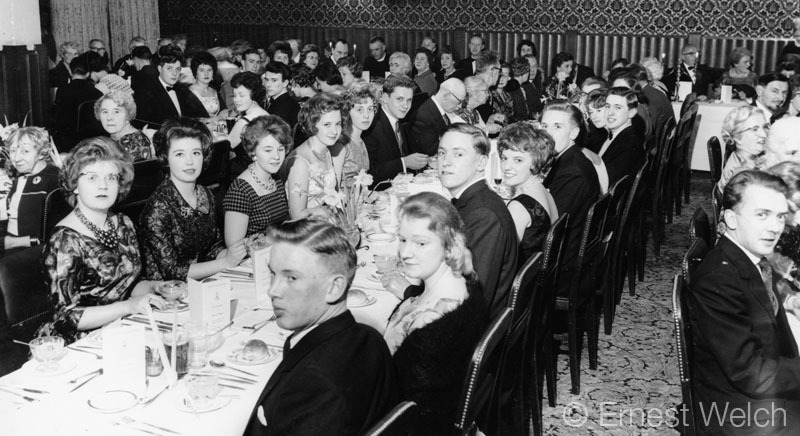 The inaugural dinner, like the very first, was held at The Stork Hotel on the 12th April 1951. Title page for the 1951 dinner. On the list of those who attended is the name C. Le Bon, headmaster at Wolverhampton Road Schools and nothing to do with Duran Duran, as far as I know! Two Chuckery teachers were also in attendance, Miss V. Millington and Mrs. Kathleen Nicklin. In the book for 1965 some wag decided it would be fun to sign in the name of a well known German despot. Unfortunately his spelling wasn’t all it should be, or his knowledge of history as it came out as “Adolph Hilter”….come to think of it, probably a different despot altogether! The menu for the annual dinner in 1974. 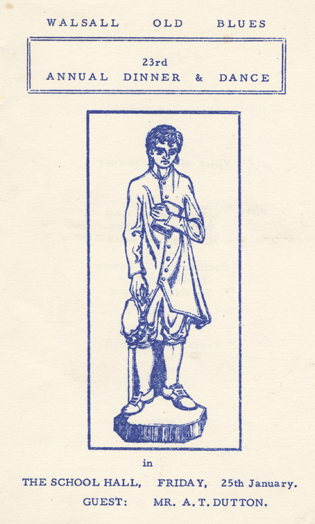 The second volume ended in 1973 and I thought that the dinners stopped too, but that isn’t so, I came across a menu for the 1974 dinner dance with an illustration of the Blue Coat boy statue on the cover. 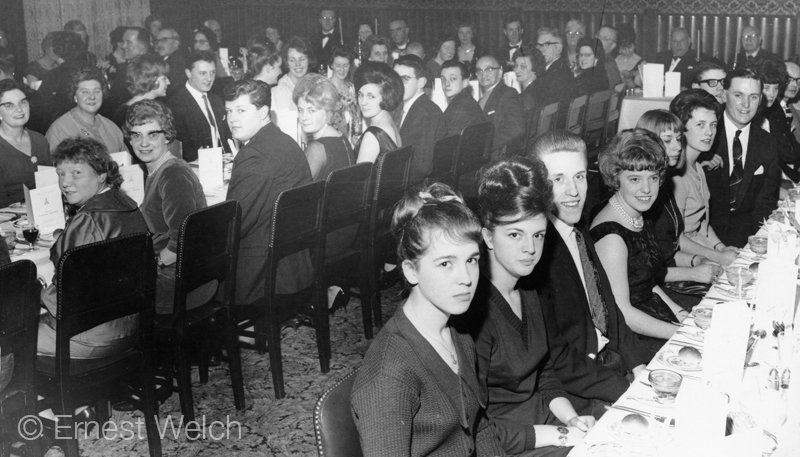 Over the years no doubt, hundreds of photographs of the annual dinner dances have been taken but I own only a few of them and probably taken in the same year around 1966. On the second row, far right is Freda Blanchard a committee member of the Old Blues. Directly in front of her is another familiar face, Eileen Reeves. Another photograph of similar vintage to the one above. Again of similar vintage. Happy looking bunch aren’t they? Since publishing this post some weeks ago I have come across more items in, as my wife puts it, “my junk file”. 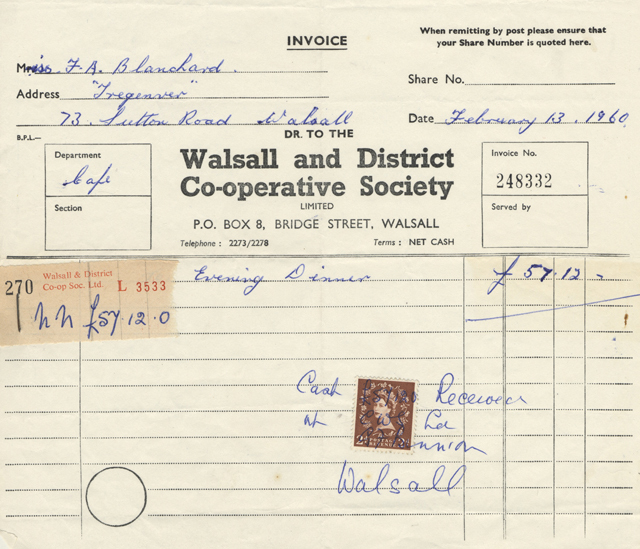 I was preparing to put together a new post about Walsall Co-op and was looking for a Co-op check stub when I came across the bill for the Old Blues Association Dinner held at the Kenmare Restaurant on 12th February 1960. Just to prove the Dinner was paid for promptly the day after I have included actual invoice sent to Miss Freda Blanchard as well as the pupil’s artwork entry for that year along with the signatures of those who attended. Heading the list was the guest for that year, Sir Cliff Tibbits of the saddlery company, Jabez Cliff & Co. Limited. The company has in recent weeks gone into administration after over two-hundred years of trading. The old premises occupied by the company in Lower Forster Street fell victim to the Phantom Flame Flinger of Old Walsall Town in 2011. 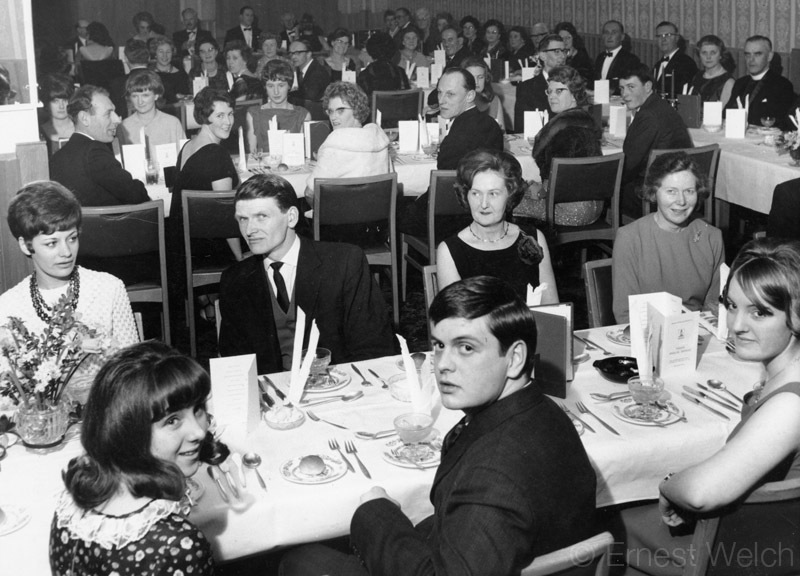 The Old Blues Association Dinner from 1960 held at the Kenmare Restaurant. £57 12 shillings total…….how much divi’ was that worth? You are currently reading The Old Blues Association at Walsall Life.